ASC’s West Australian submarine maintenance and upgrade facility has welcomed four new apprentices to its ranks. 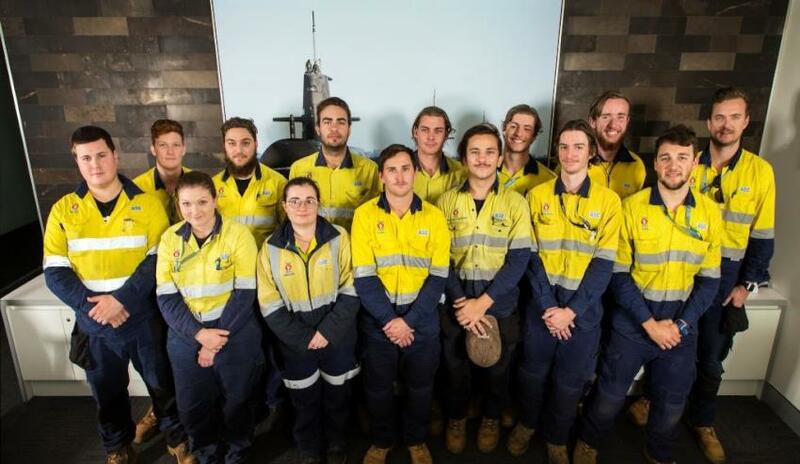 The sovereign submarine company held an event at ASC West where general manager Craig Vandepeer congratulated the entire WA apprenticeship group, numbering 14 across four year levels, as well as two newly qualified tradespeople, electrician Dylan Harbron and mechanical tradesperson Lachlan Cartledge. Vandepeer said ASC was strongly committed to vocational training, employing approximately 50 apprentices in its submarine business in WA and South Australia. "Our ongoing recruitment of trade apprentices this year in WA, and in the years to come, recognises the increased activity at ASC West to meet improved submarine availability," said Vandepeer. "Australia relies on ASC, and we rely on our tradespeople to deliver world benchmark submarine platform maintenance and upgrades. "Following a demanding and diverse period of training, in which we have tested and confirmed the skills of Dylan and Lachlan, we are confident that you will meet the high standards required in submarine maintenance and upgrade here in WA." ASC’s submarine business employs more than 350 personnel in Henderson, including about 115 tradespeople, along with 1,100 personnel at its deep maintenance site in Osborne, SA. ASC also conducts vocational training, selecting approximately 16 apprentices in SA and WA at the start of each year from approximately 1,000 applicants. "ASC will later this year seek applications for our next apprenticeship intake and, as today’s graduates know, exciting and challenging careers are on offer at ASC supporting Australia’s operational submarine fleet," said Vandepeer. Half-cycle docking of the Collins Class fleet is also carried out by around 400 workers at ASC WA. ASC was recently tasked with undertaking a study known as the Collins Class Submarine Life of Type Extension Definition Plan, which included examining the move of the Collins Class submarine full-cycle docking to WA. ASC CEO and managing director Stuart Whiley recently confirmed that a draft of the discussion plan relating to any potential move was delivered to Defence at the start of May this year. "We were tasked under a letter in December of last year to recommence that study work, we've recommenced that study work and we've delivered an initial draft discussion document to Defence in early May and we've had very high level preliminary feedback on that discussion," Whiley told Senate estimates in May. Whiley said ASC is awaiting feedback from Defence before it can begin work on the final document. If the plan to relocate goes ahead, hundreds of jobs could be moved from Adelaide to WA. There are currently around 700 ASC workers carrying out the maintenance and full-cycle docking work in Adelaide on the Collins Class submarine fleet.